Mary Poppins Comes Back by P.L. Travers was first published in 1935 but my copy is a 1997 paperback. For years I thought there was only the one Mary Poppins book, but this one is the second of four. It’s illustrated by Mary Shepard. Nothing seems to have gone right within the Banks household for ages, probably not since Mary Poppins left them in fact. The boot boy has polished Mr Banks’s bowler hat with boot polish and to make matters even worse Mr Banks has just had a letter from his old nanny. She’s coming to stay with them and he’s horrified by that idea. Lots of children’s nannies have come and gone since Mary Poppins left but nobody but Mary can cope with them. There are five children in the family so it is quite a handful, especially as they Miss Mary Poppins so much. Mrs Banks is being driven mad by them all and she tells Jane and Michael to take the twins to the park in their perambulator. Michael takes his kite to fly and when it flies so high in the sky that they can’t see it the Park Keeper helps to haul on its string. 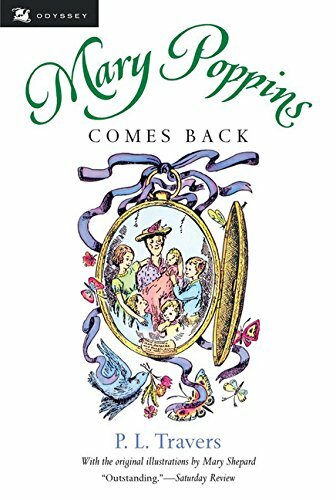 But it isn’t their green and yellow kite which appears, it’s something navy blue and as it hurtles towards them they realise that it’s Mary Poppins – she has come back just as suddenly as she had left. Mary Poppins is of course completely different from the Disney version, she leads the children into all sorts of adventures, they meet strange people and Mary Poppins isn’t at all sweet or even caring, but they have great fun. Apparently P.L. Travers was so upset by the Disney film version of her first book that she stipulated in her will that no other films were to be made after her death. At Christmas I watched the film Saving Mr Banks which is about the terrible amount of wrangling that Walt Disney had to go through to get P.L. Travers to allow him to turn her Mary Poppins books into a film. Actually it’s about the only film that I’ve liked with Tom Hanks in it, I’m not a fan. I didn’t really know much about P.L. 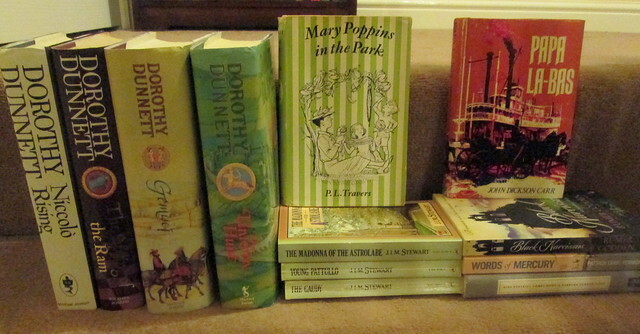 Travers- beyond that she hadn’t been at all happy with what had been done to her books, anyway the film Saving Mr Banks was enjoyable and it made me think that it was about time that I read at least one of the Mary Poppins books. Luckily I found a paperback copy of the first book at the Oxfam bookshop in Morningside, Edinburgh. The book was first published in 1934. It was an enjoyable read and I was surprised that it was really quite similar to the Mary Poppins film, well the bits of it that they used anyway. Mary Poppins herself comes across as being less prim and snooty than her film version. Presumably Walt Disney thought it would be a good idea to make her ‘posh’ English. I have heard that all English accents are seen as being upper class in America though – or they were in the past. This was just a good light read that I embarked on when I was in the midst of a heavy cold, and it filled in one of those gaps that I have in children’s literature, I think I went on to adult books too early really. At the same time I bought this one I also bought a book called The Family from One End Street by Eve Garnett. I hadn’t even heard of it but it’s apparently a children’s classic and it won the Carnegie Medal. Have any of you read it? I’m thankful to be able to say that most of the gifts I got at Christmas were either books or book related, in fact I got so many I think I’ll be doing two posts on my haul. I went a bit Dorothy Dunnett mad and decided to collect her Niccolo series, I hope I enjoy them. As it gets towards Christmas I just tell Jack to wrap up any books that I buy in second-hand bookshops, most of the time I forget what the books are by the time it comes to unwrapping them at Christmas so it’s still a surprise, the kind I like. I really don’t enjoy real surprises as sometimes they turn into real shocks! I didn’t read the Mary Poppins books as a child and after enjoying the film Saving Mr Banks at Christmas about P.L Travers’s relationship with Walt Disney and the making of Mary Poppins I thought it was about time I rectified that and luckily I found an old copy in St Andrews. This year I plan to concentrate on reading my own books!